Above: York Minster's Star of David - image credit, York Minster. The Holocaust, the genocide masterminded by the Nazis, took place between 1941 and 1945, at the same time as the Second World War was being fought. More than fifty years later, the horrors of this period continue to shock and continue to reverberate. Around six million Jews were murdered, while other victims numbered in the millions and thousands, including Soviet prisoners of war, the disabled, Jehovah's witnesses, homosexuals, Romani and ethnic Poles. These victims endured enslavement in concentration camps, imprisonment, torture and murder, and the testimonies of those who survived these horrors testifies to the dark depths of human hatred, intolerance and bigotry. Holocaust Memorial Day Trust's theme for 2017 is how can life go on? The survivor and prolific author Elie Wiesel, who died last year, explained that "for the survivor death is not the problem. Death was an everyday occurrence. We learned to live with Death. The problem is to adjust to life, to living. You must teach us about living." This year's theme incorporates issues including trauma and coming to terms with the past, displacement and seeking refuge, justice, rebuilding communities, and reconciliation and forgiveness. These issues continue to resonate today, and should be considered by each and every one of us. Yesterday, I attended a memorial service at York Minster, and a beautiful Star of David was lit in the Chapter House using candles. The service was moving, and included a talk from a young man whose relative had perished in the Holocaust. Attending services such as that at York Minster always brings back memories for me of visiting Auschwitz in 2009 while at secondary school. While our teacher prepared us as much as she could for what we would experience, visiting the camp was something that I don't think any of us could forget. Emotions ran high that day, and subsequently, but how was it possible for any of us to imagine the suffering inflicted on those who walked through Auschwitz's gates, many of whom never left? How could any of us truly come to terms with the horrors inflicted at Auschwitz, and other killing camps such as Treblinka or Sobibor? I have included some photos taken from the trip. These serve as powerful reminders of how cruelty, intolerance and hatred can extend to unspeakable crimes and to loss of life. They remind us that racism, xenophobia, anti-Semitism, ethnic cleansing, homophobia and prejudice are still with us today. These issues will always be important. They are inextricably tied to human nature, and remind us of what can happen when scapegoats are sought for perceived unfairness or problems in society. Recently, I attended an exhibition about one of the most famous victims of the Holocaust, Anne Frank, a diarist who died at Bergen-Belsen concentration camp at the age of fifteen. The exhibition's title was 'A history for today'. It was incredibly moving to revisit Anne's story and to consider her legacy, but two photos, in particular, caught my eye and provided a startling reminder that, perhaps, we have not really moved forward since the dark days of 1941-45. Genocides in Cambodia, Rwanda, Bosnia, and Darfur - among others - are a testament to the unwillingness, or inability, of subsequent generations to learn from the horrors of the past. These two photos, I think, speak a thousand words. Hatred, intolerance, bigotry and prejudice are still very much with us, and there are still lessons to be learned from the Holocaust. Happy New Year! 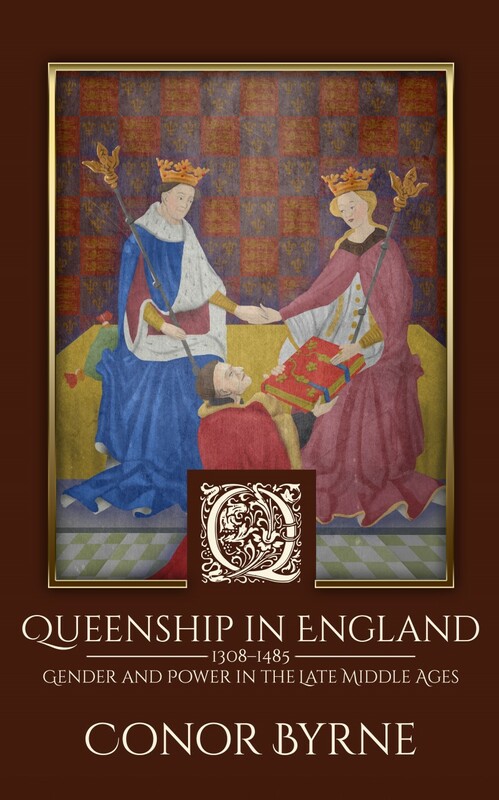 I am delighted to inform you that my new book, Queenship in England, will be published on 12 January 2017 by MadeGlobal. The book is currently available on Amazon to preorder on Kindle, and will be available soon in paperback. You can preorder it on Kindle here. 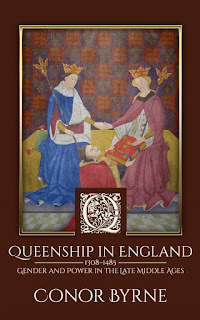 Queenship in England is a study of the institution of queenship between 1308 and 1485, and examines the experiences of the nine women who occupied the position of queen during that period: Isabella of France; Philippa of Hainault; Anne of Bohemia; Isabelle of France; Joan of Navarre; Katherine of Valois; Margaret of Anjou; Elizabeth Wydeville; and Anne Neville. The book has been praised by Amy Licence, author of Catherine of Aragon: An Intimate Life of Henry VIII's True Wife, as offering 'an interesting and accessible exploration of medieval queenship in relation to gender expectations', while Toni Mount, author of A Year in the Life of Medieval England, described it as 'very readable' and 'thoroughly researched'. It was absolutely fascinating to research and write this book, and I hope you will enjoy reading it.